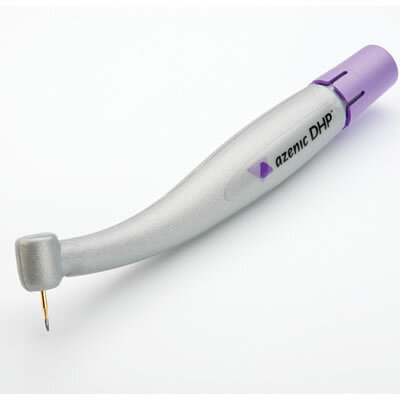 Azenic DHP Disposable Handpiece | Azenic, Inc.
Azenic DHP Disposable Handpiece Azenic, Inc Azenic’s DHP delivers dentistry’s premier disposable, high-speed handpiece. The Azenic DHP disposable high-speed handpiece offers a high-performance handpiece with the convenience of singlepatient- use disposability. According to the manufacturer, the disposable handpiece is an ideal choice in a number of clinical situations, including old crown and bridge removal and crown preparations. Using the DHP for these difficult cases reduces the intensive wear-and-tear on the metallic handpiece, saving the turbines and bearings and reducing the maintenance and refurbishment costs. It is also ideal for surgical extractions, third molar work, or crown lengthening—because the DHP produces no chip-air, air embolisms are not a concern.